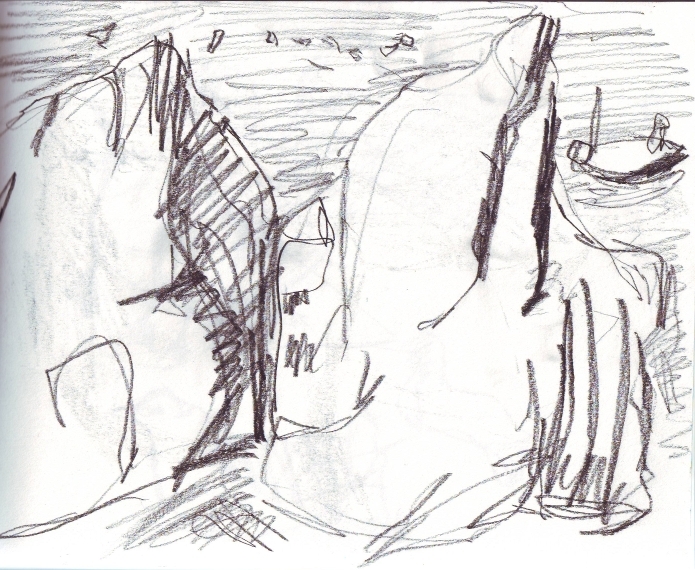 January is my birthday month and I usually spend the day drawing with good friend and fellow artist Leo du Feu. The day is always a treasured event; this year we decided to take the train to Dunbar and explore from there. We headed due west to Belhaven bay along the cliff top walk with stunning views across to the Bass Rock. A diverse walk starting in the town and ending at the end of a dramatic pine plantation looking across Tyninghame estuary. We were lucky enough to see a kingfisher amongst many other birds that day. 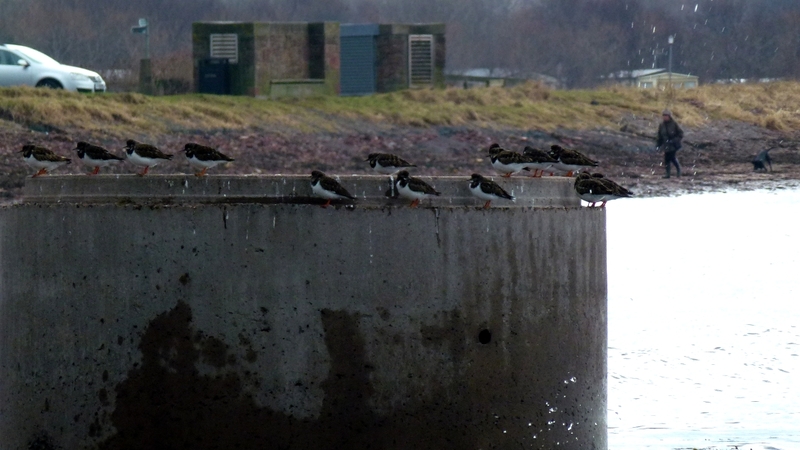 I loved these turnstones huddling along the concrete boulder in Belhaven bay. 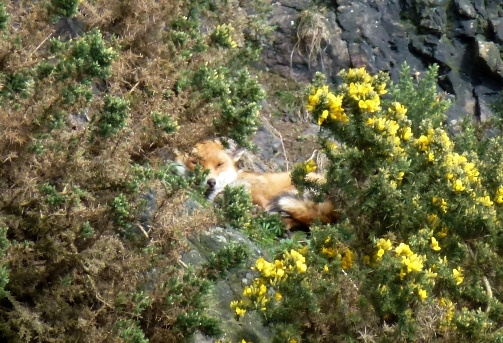 February provided a brief stay on the shores of Loch Fyne with friends. After a late night of table tennis and beer, Paul and I were the first up in the morning and decided to walk along the loch shore in the early morning light. 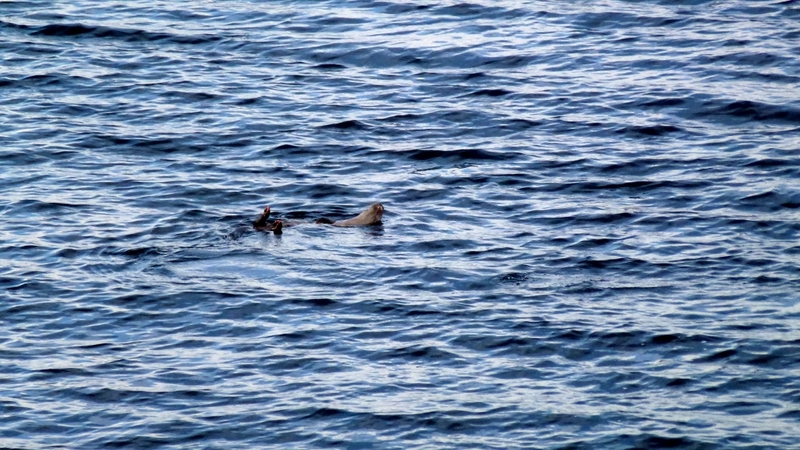 I’m so glad we did – we ended up spending about twenty minutes watching a young otter feeding and playing. from Nature Cure (2005, London:Chatto & Windus) pp 200-201. March saw my first stay in the place my parents would be calling home by the end of the year – in the county of Northumberland, four miles in from the northern seaside town of Seahouses. It is exciting for me to have a base for exploring this new landscape, hopefully gaining insight into the changing moods and seasons of it. I have started to find my feet a bit now and am planning on spending time there in 2015. I look forward to discovering the abundant wildlife and engaging with the fascinating history of the place, much of which involves creatures: St Cuthbert and the eider ducks, Bede and the sparrow flying through the banquetting hall, the interlocking cormorants in the Lindisfarne Gospels, the Chillingham cattle. 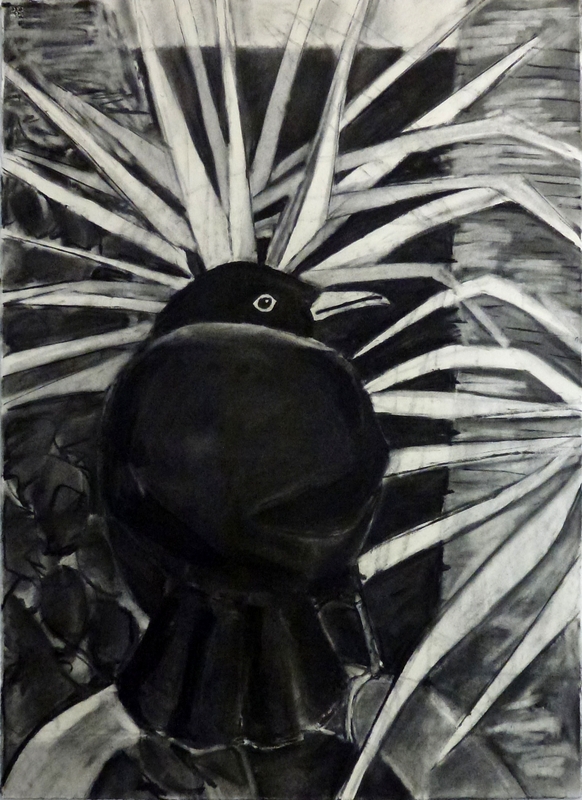 I also completed a commission in March for a blackbird in a palm tree for one of my lecturers at Edinburgh University – it was a real privilege to make a piece for her and I’m pleased to say she was delighted with my response to the brief. With the increasing light and warmth in April I was able to get outside a bit and fitted in a trip to north Fife with a particularly enjoyable visit to the sweeping beach at Tentsmuir point to watch the seals and look out for sea eagles (none to be seen this time but it did motivate me to read the fantastic Eagle’s Way by Jim Crumley – worth spending some time with). 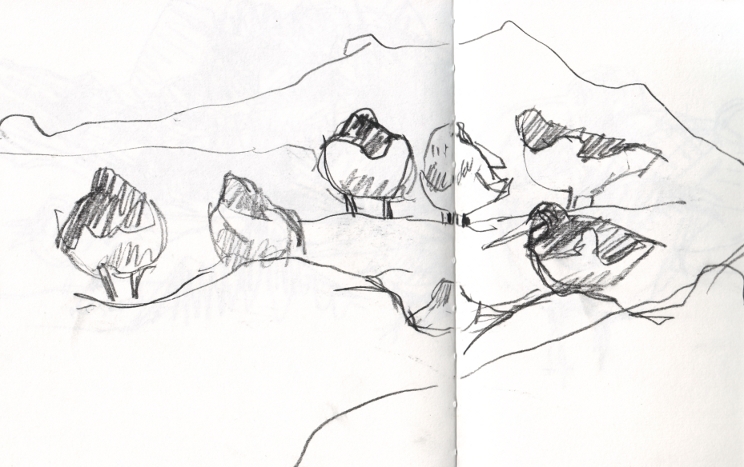 I spent a warm April day at St Abb’s Head drawing with friends – it was interesting to be there at the very beginning of the seabird breeding season. With May came a penultimate visit to my childhood home in n orth east Cumbria before my parents hopped across the pennines to Northumberland. It was a weekend of beginning to let go of the familiar, but also of unexpected new discoveries. 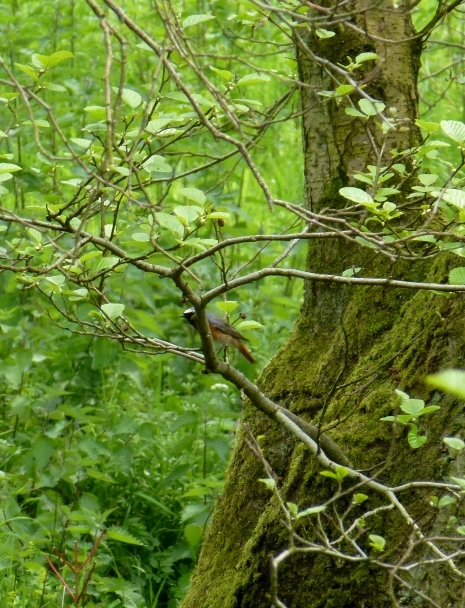 A walk through the small bit of land attached to the Mill produced my first ever redstarts! 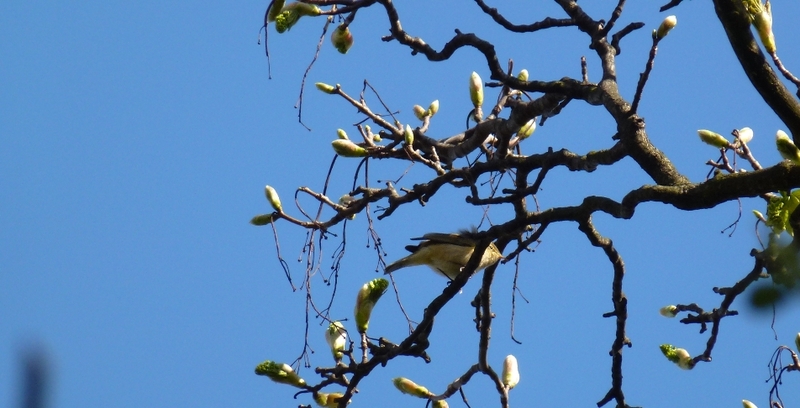 I saw the female first, initially mistaken for a robin, until a strange flick of bright orange tail made me look again. The male soon appeared and I was able to watch them fly in and out of their nest hole in a tree hollow. 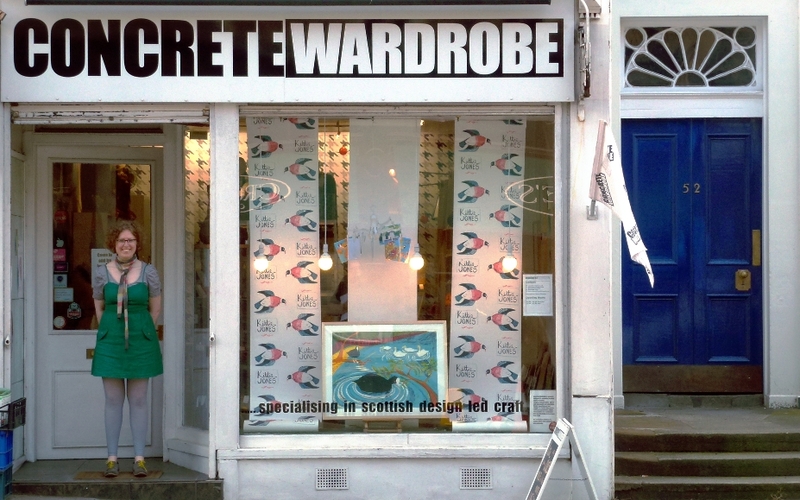 Back in Edinburgh I was maker of the month at Concrete Wardrobe on Broughton Street. I enjoyed printing my own wallpaper to go in the window of this fantastic shop which celebrates the work of many quality Scottish makers. 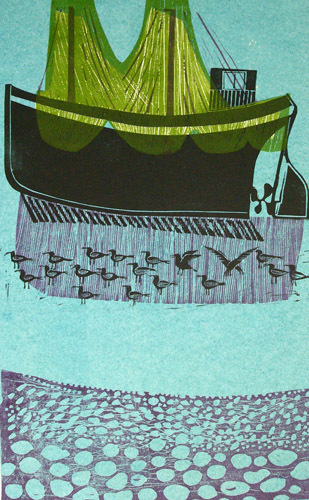 I was also pleased to exhibit a large scale screen print for the first time, Coots and Swans, seen here in the window. 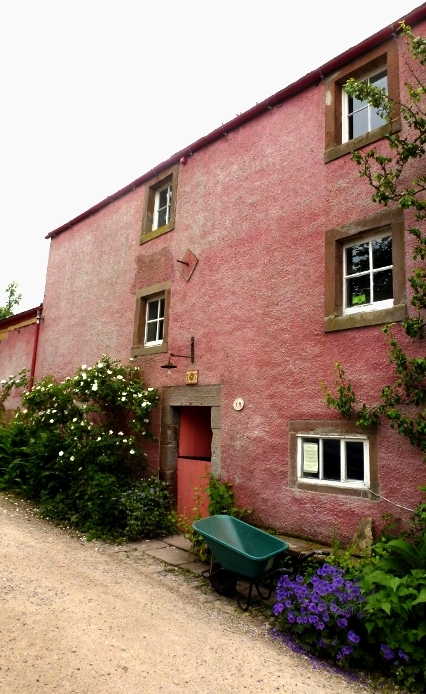 And finally in June my family said goodbye to the Watermill at Little Salkeld. The place had been our family home and business for the last forty years so it was no mean feat to move everything and everyone out of it. We all gathered for the final weekend and amidst all the box packing and labelling I was able to take a few photos and enjoy some wonderful final experiences of the place. The Mill – notice the four punctuation marks on the roof – familiar? The four young swallows at the top of this post fledged during the weekend we were down for the move. I watched them go from their nest in the shed, to sitting high up on the roof of the mill as their worried parents fed them, wheeling and diving nervously around them. By the time Monday came they were confidently sitting on the power lines looking like kings of the world. The kitchen window was probably where it all started for me. Looking out onto Sunnygill beck it provided a perfect hide for watching an abundance of bird life go by throughout my childhood and beyond. 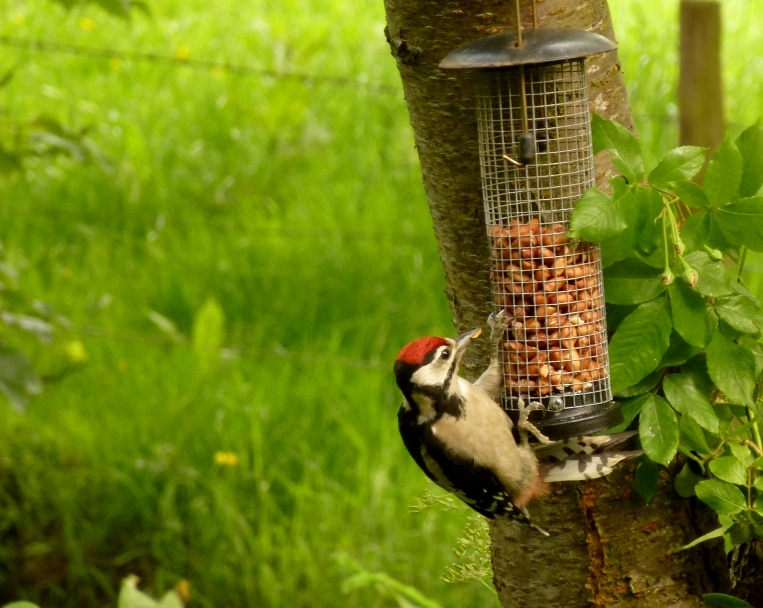 Regular visitors included great spotted woodpeckers, such as this handsome juvenile, photographed on the weekend of the move. 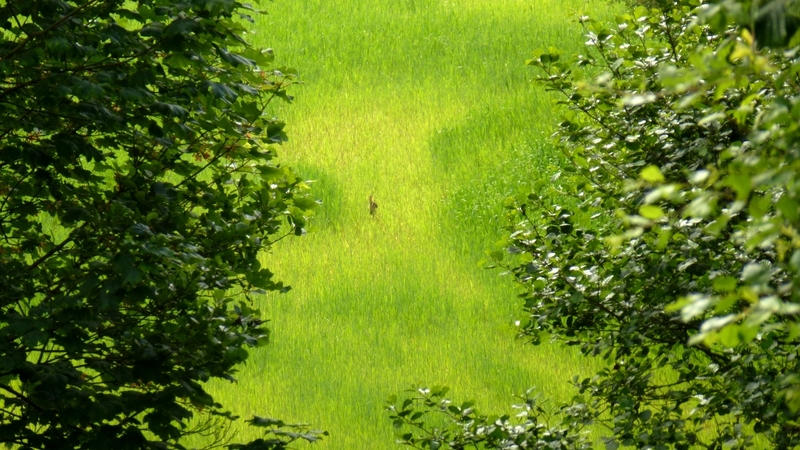 This hare popped up to say goodbye – the first time I had seen one so close to the place. 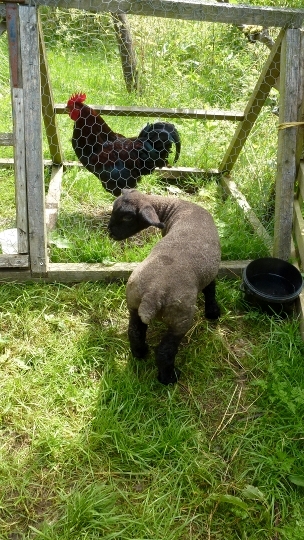 In typical family tradition the move was not without a selection of stray creatures being shoved into the back of motor vehicles (don’t ask) – in this instance it was Mr Cockaloo and Betty the orphan lamb along with a hen and four newly hatched chicks in a rabbit hutch! A number of my favourite artists happen to be women as well so I thought I would write a post about them and their work. 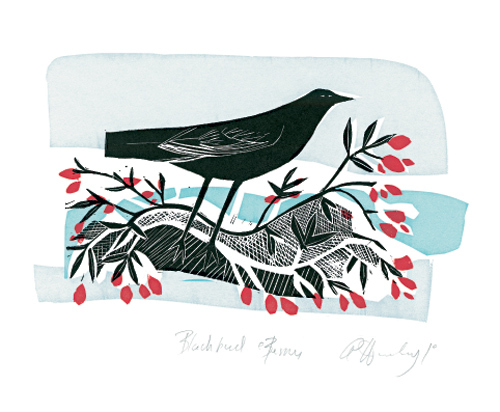 As always, there might be a bit of a bias towards the depiction of birds in the work I’ve chosen, but I’m sure my dear reader will understand! 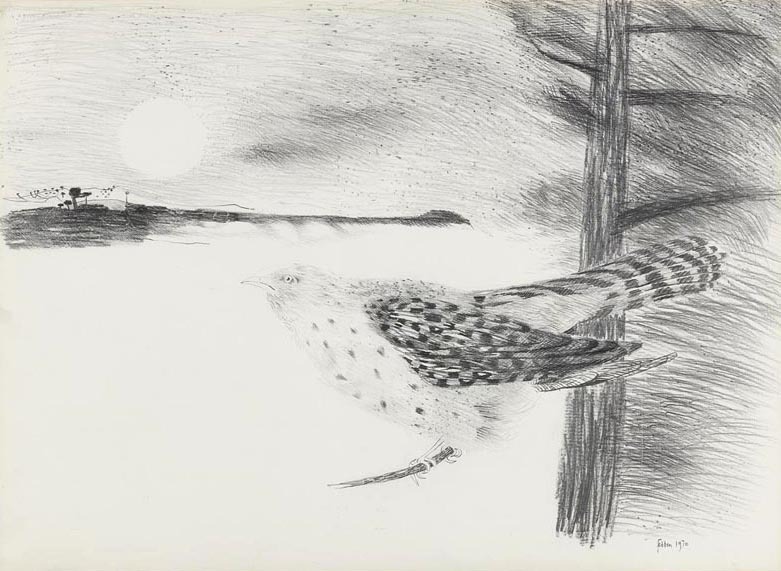 I have known this Mary Fedden pencil drawing of a cuckoo for a long time. The quality of the pencil marks, the use of space in the drawing and the composition conjure up something both dynamic and understated. 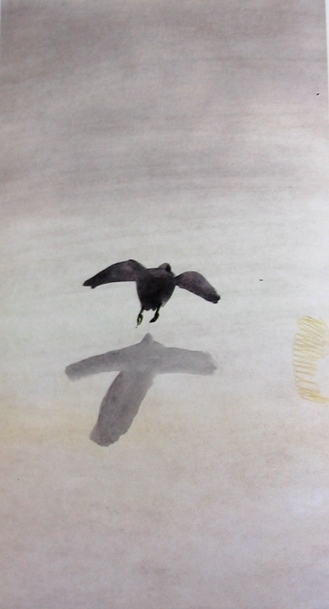 Mary Fedden is most certainly an artist who works with her own set of shapes, often distorting the reality of things. 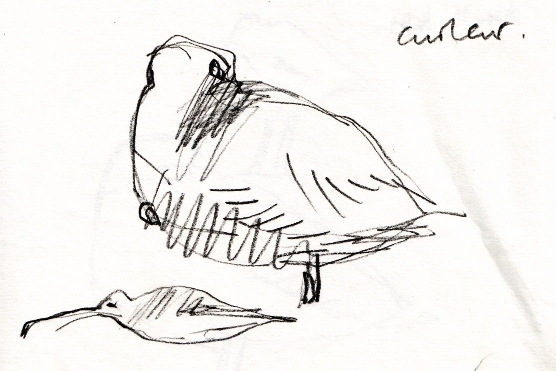 Her birds tend to be chunkier than in reality and often inhabit simplifed worlds of mark and shape. 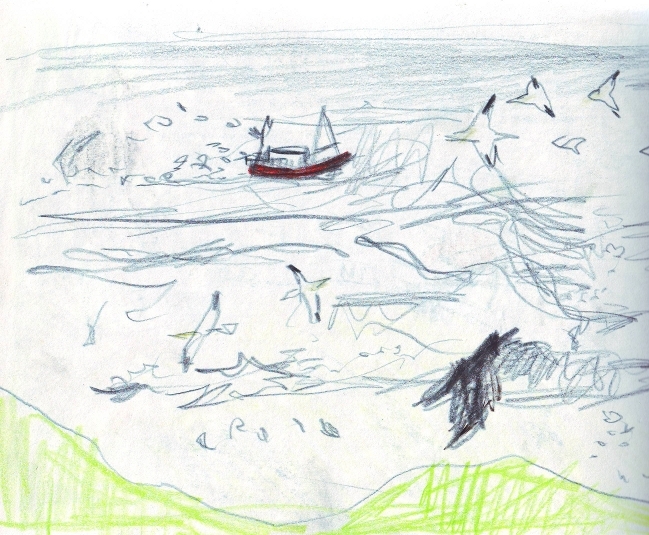 After visiting Orkney for the first time this summer I have been enjoying looking through Sylvia Wishart – a study, published by the Pier Arts Centre. 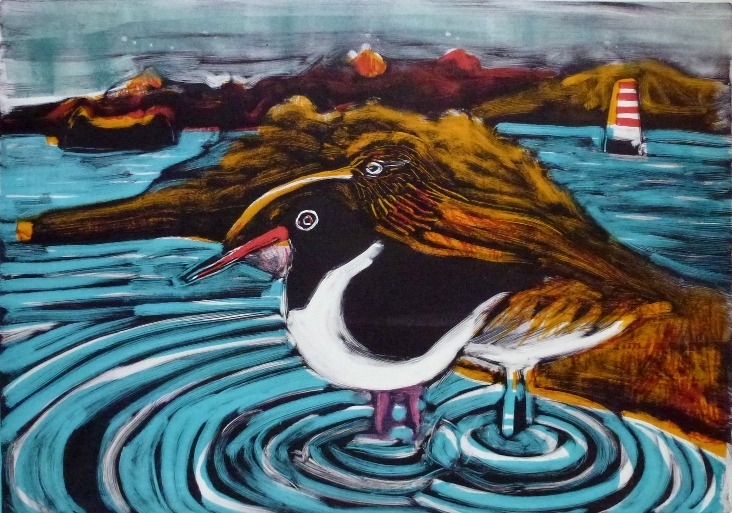 Wishart’s work has a strong sense of place, a sensitive use of colour and an other-worldly quality to it. 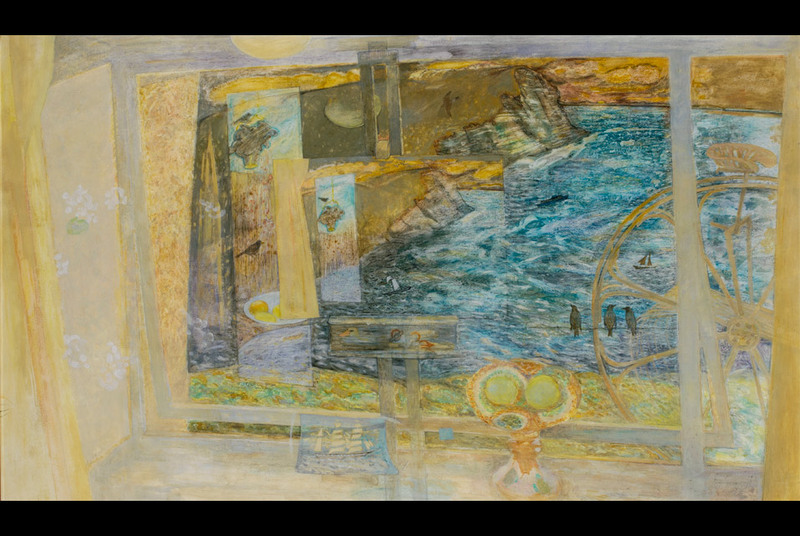 For many years her work developed in an abstract direction, although always remaining derived from the landscape and history of the areas of Orkney she lived in. It is always informative reading how ideas for subjects begin. I like in this story how Wishart not only finds a new subject matter to grapple with – the reflected window – but also finds herself returning to observational work. It is notable that by returning to observing reality she makes probably her most bizarre and strange series of pieces. 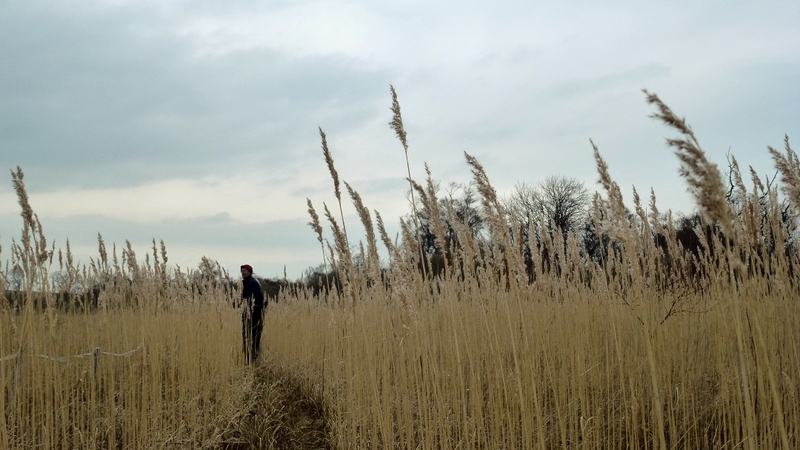 As Philip Guston says: ‘The visible world…is abstract and mysterious enough. 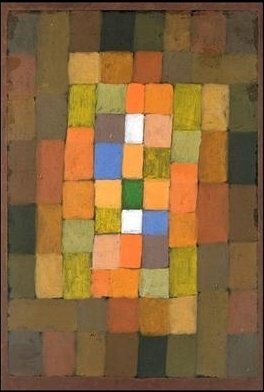 I don’t think one needs to depart from it in order to make art’. 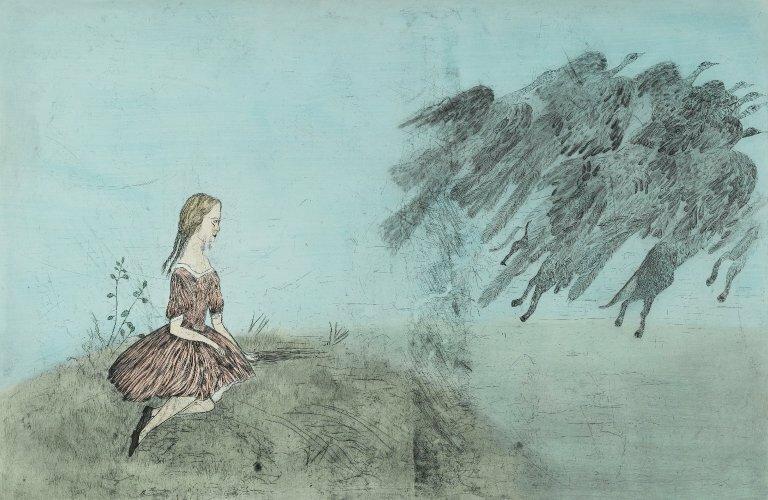 Kiki Smith is an artist who is interested in the human body, mythology and the natural world. 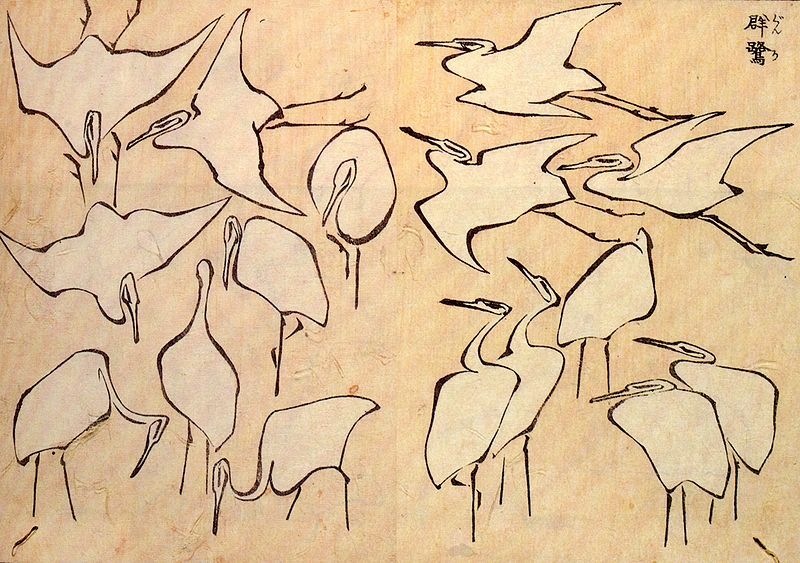 Her depictions of birds often contain strange narratives. 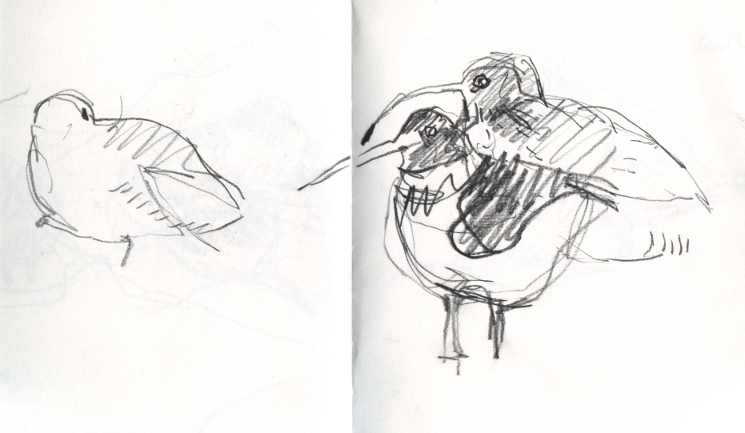 Despite trawling the net I was unable to find much information about where either of the images below derived from. 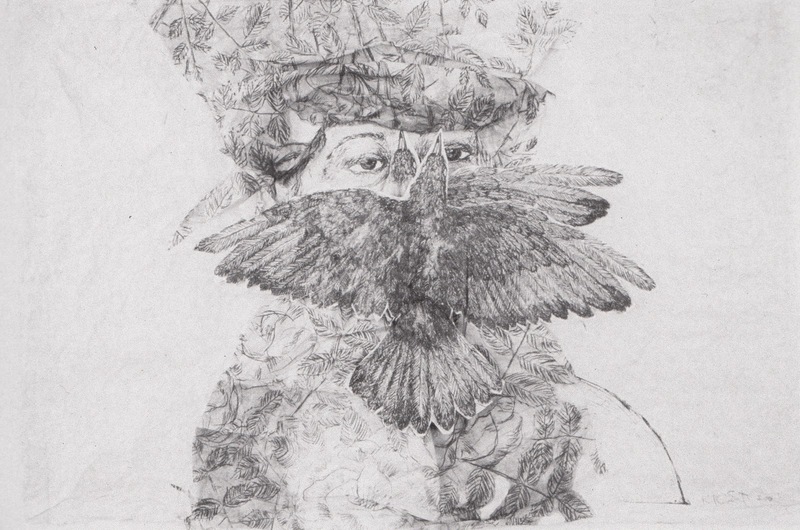 They are beautifully delicate and intriguing works – Smith has a particular love of drawing fur, feathers and hair which often feature in her drawn work. 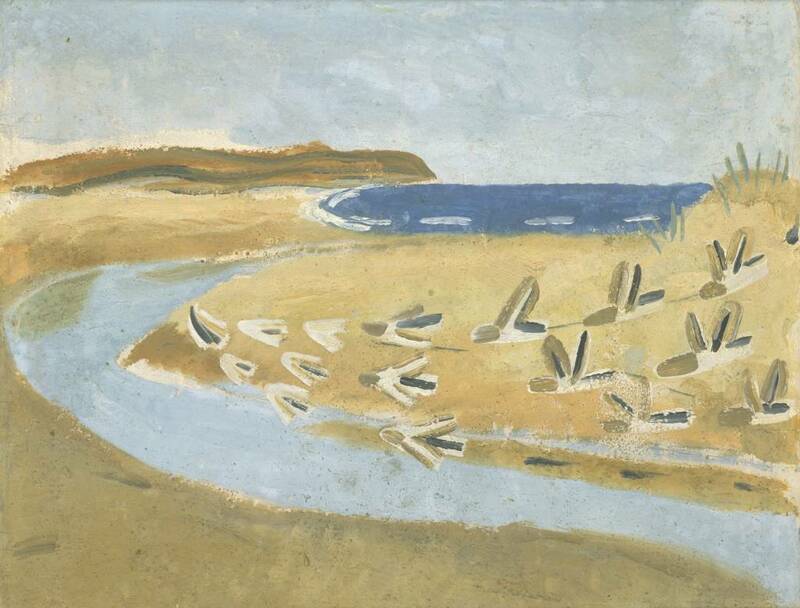 The following two paintings are both titled Sandpipers in Alnmouth and are by Winifred Nicholson. 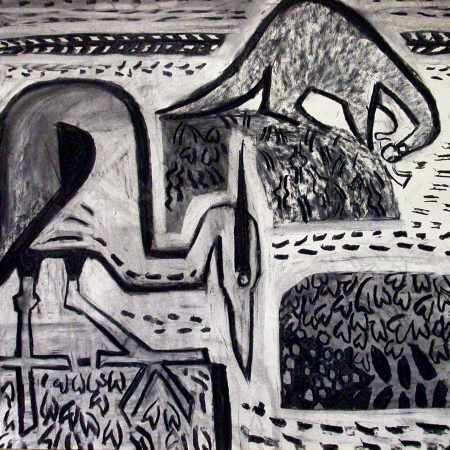 Both works contain a strong sense of a moment captured; although the birds are quite clumsily described, the geometric shapes they make give a strong sense of movement and lightness to them. 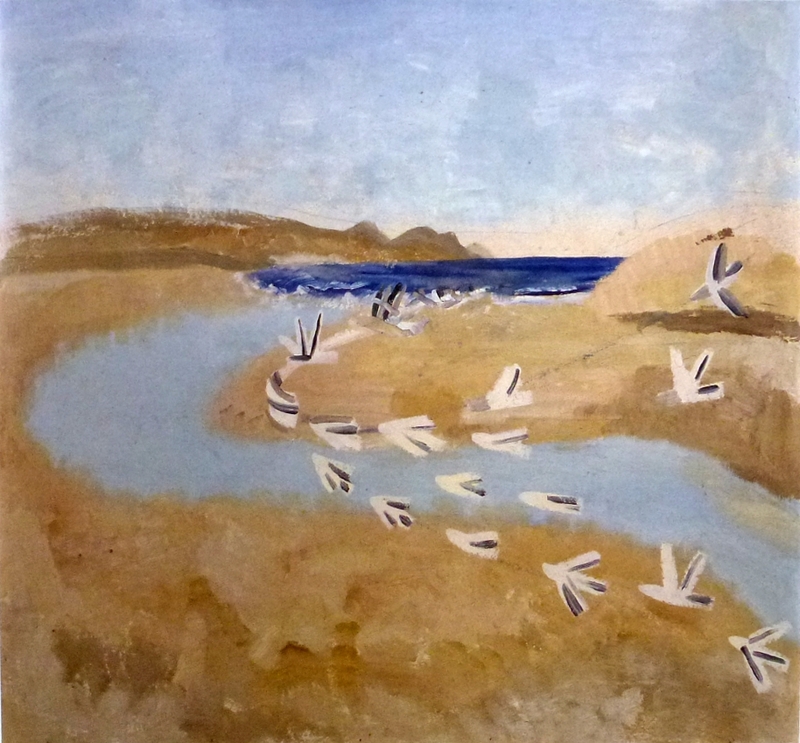 The dynamic movement of the flock is offset by the stillness of the scene beyond – the well-balanced composition along with the limited palette of colours provide a sense of tranquility. It is interesting that the artist produced two paintings of the same image – I wonder if the top one might have been painted on the spot or as a study for the second one which seems more designed (I prefer the top one for its feeling of immediacy). And finally, a couple of paintings by Mary Newcomb, an artist who always brings a fresh point of view to things. 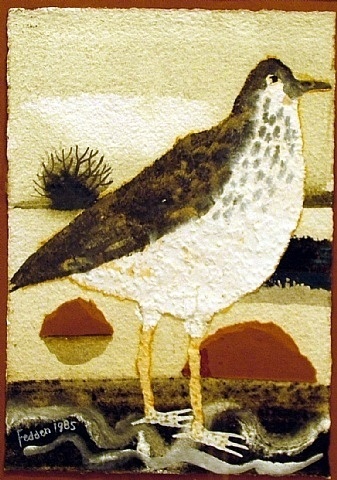 Her work contains a great sense of colour and design, along with a lightness of touch and a poetic vision of the world. This first painting is called A hedge in November and is a work I have been familiar with for a while. Every time I look at it I am astounded by how Newcomb has managed to capture such a strong sense of a wintery hedge through such unrepresentational means. 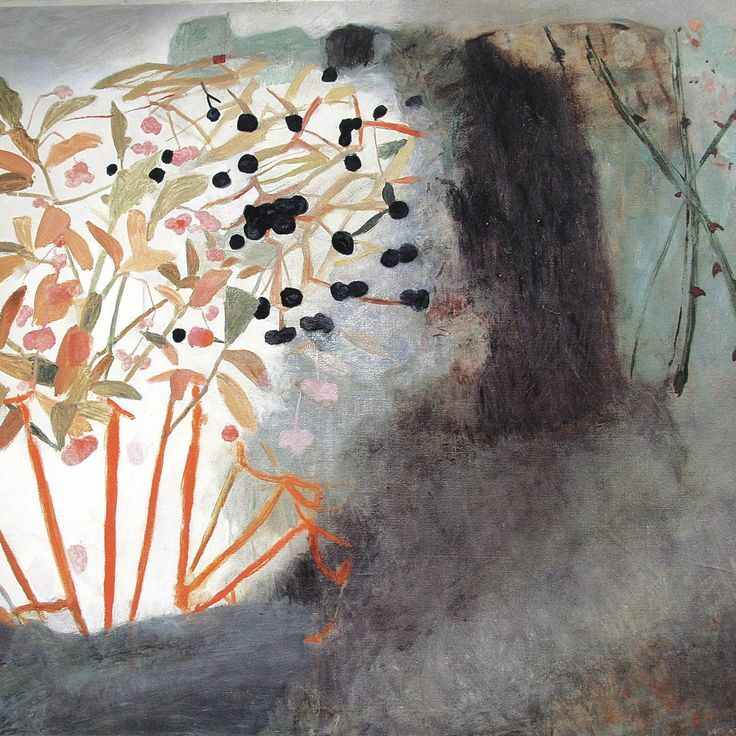 In the berry tree on the left, the strong colours in the stems against the grey background contrast intensely with the heavy black forms of the berries. The beautifully silhouetted thorn branches on the right side of the canvas add to the form of the hedge and give a sense of space to the piece. 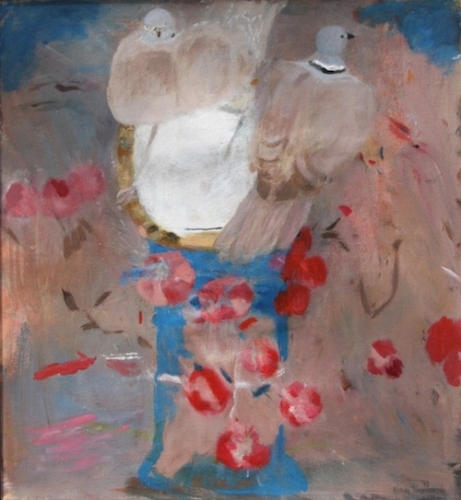 This painting, entitled Collared doves lifted by light, is new to me. My interpretation of the image is these are two doves on a blue-painted bird bath surrounded by red flowers. 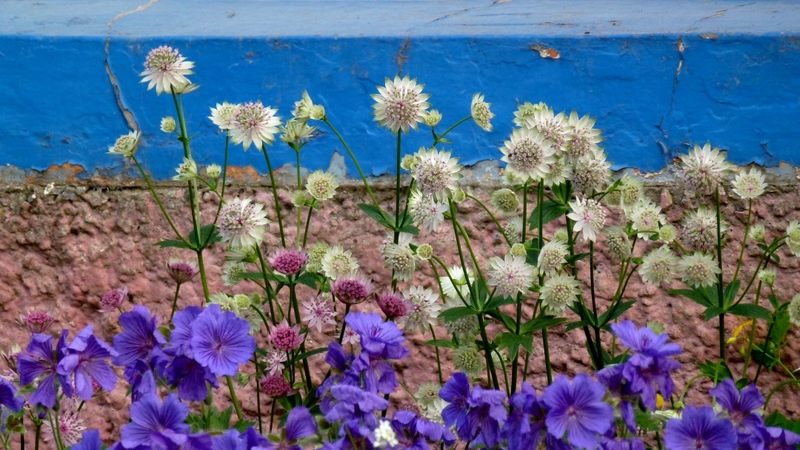 Once again there is a beautiful combination of abstract colour and form plus that noticing of an insignificant moment, which has been transformed into something beautiful, intriguing and fragile under the expert eye of Newcomb. As always it is both nourishing and uplifting to see the work of other artists – I hope you have enjoyed this insight into some of the people who inspire me. 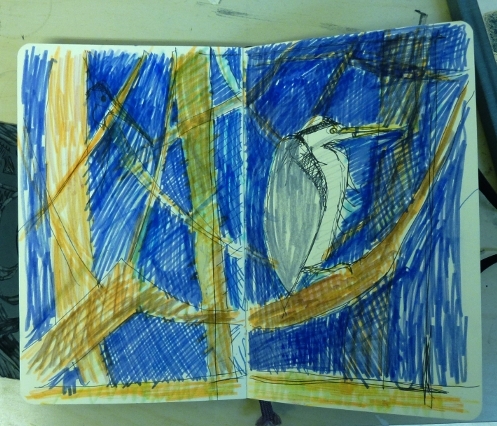 I use sketchbooks as a starting point for nearly all my work. 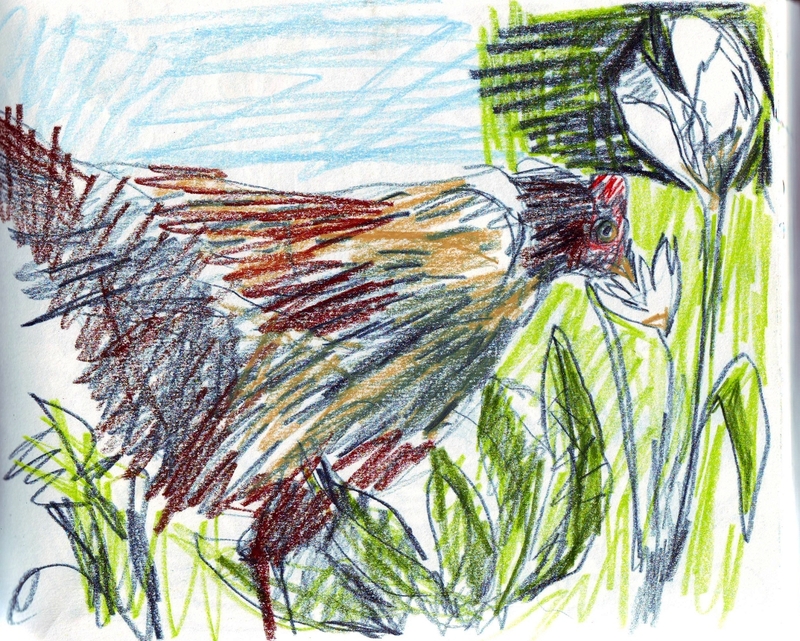 Drawing nourishes my ideas and practice. 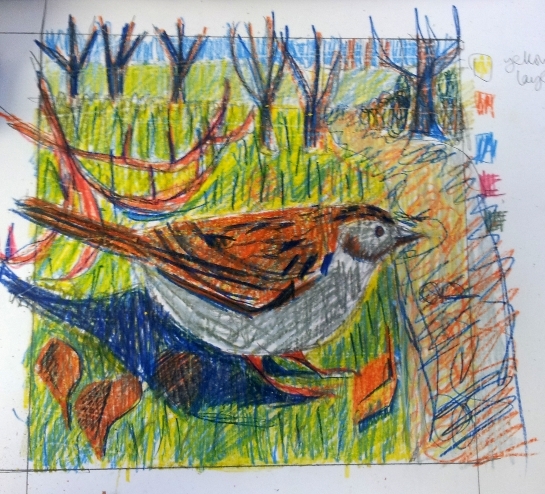 Looking at the sketchbooks of other artists can provide a way in to understanding their work, drawing is often transformative, allowing us to look and see afresh. This post combines images of my sketches, with those of others which inspire me and a couple of inspiring quotes about what drawing means. 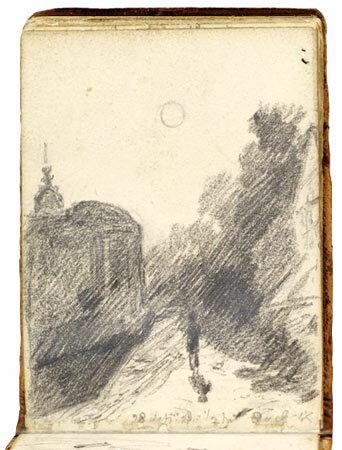 The following sketchbook image is by British landscape painter John Constable, it is an unusual image for Constable with its air of mystery and underlying narrative. If you haven’t spent time looking at Monet’s sketch books I would recommend it – many of his quick sketches describe complex space and form with energy and economy. This image, by British painter Mary Newcomb, is one I return to again and again. It is so simple and yet so deeply felt. Scottish artist Barbara Rae uses colour and paint in her sketchbooks to recreate landscapes which verge on abstraction and provide a starting point for her large scale paintings and vibrant prints. 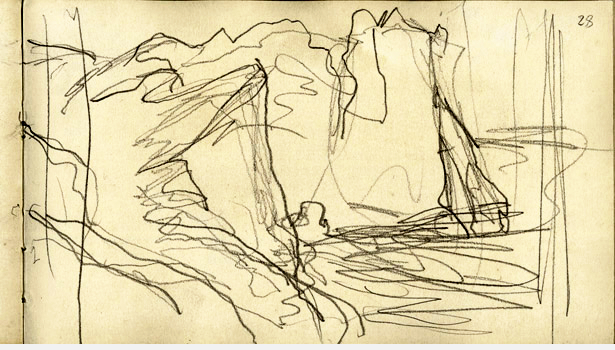 This sketch of the sea by Mondrian has an amazing quality to it which pre-empts his later grid paintings. 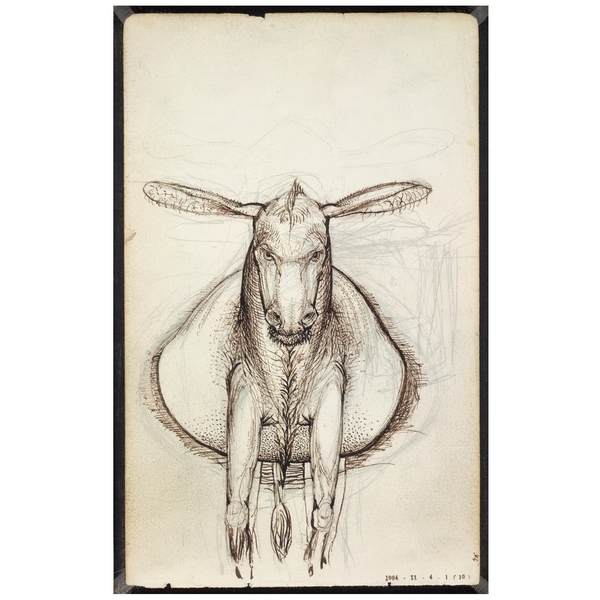 I have a facsimile of one of Samuel Palmer’s sketchbooks which contains this bizarre image of a donkey which I love! This is a quote by John Berger from his essay on drawing which can be read in full here. 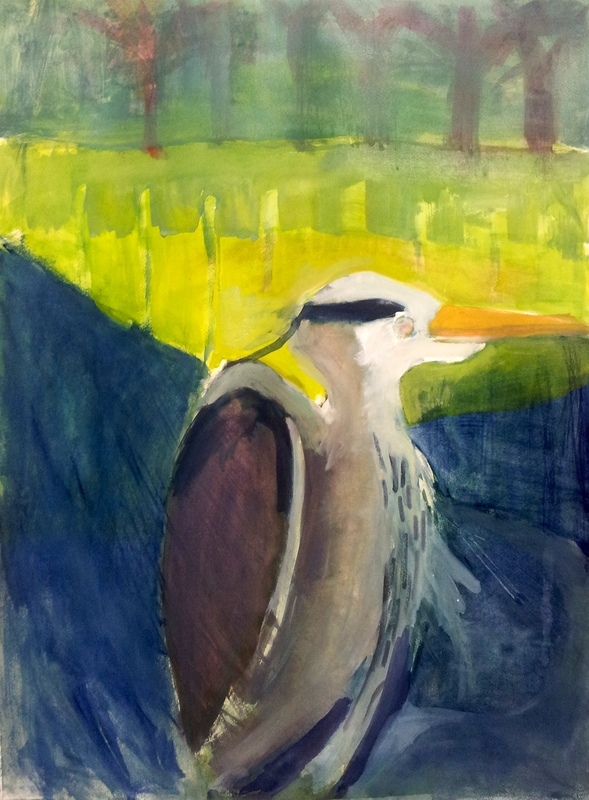 A short post today, inspired by time spent watching a preening grey heron this weekend on the Water of Leith. 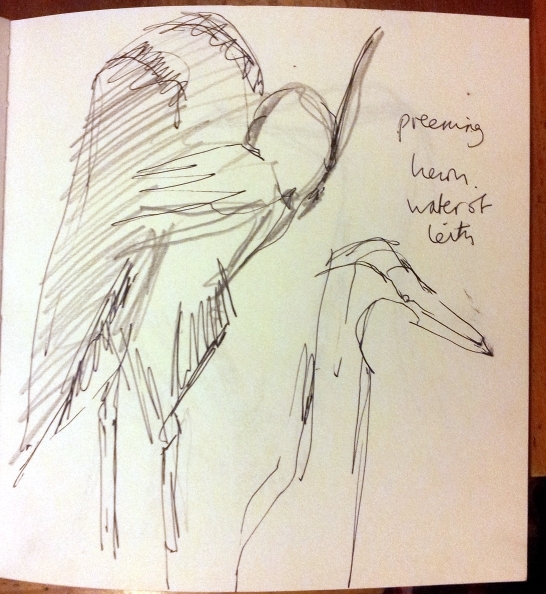 After sitting down to draw the bird, I would thoroughly recommend ‘heron-watching’ as a way to spend some quality time. The way in which they can morph from stumpy, mango-bodied birds to tall, snake-like creatures is incredible. 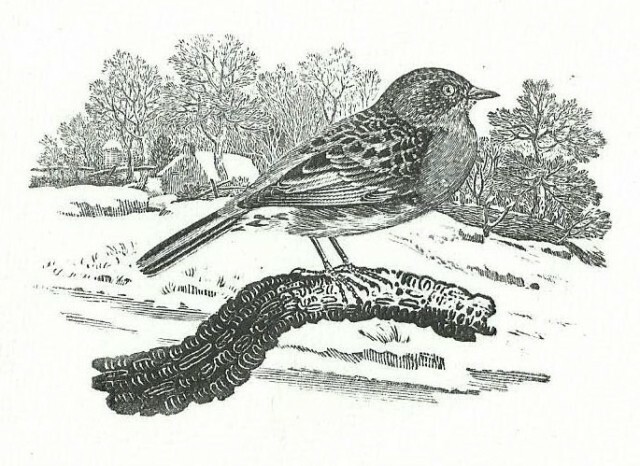 The particular bird that I was watching must have been an adult in breeding plumage as the decorative feathers which hang from its front were very prominent. I have since learnt that heron’s beaks turn from yellow to partly reddish during the breeding season – I’ll be looking out for that from now on. 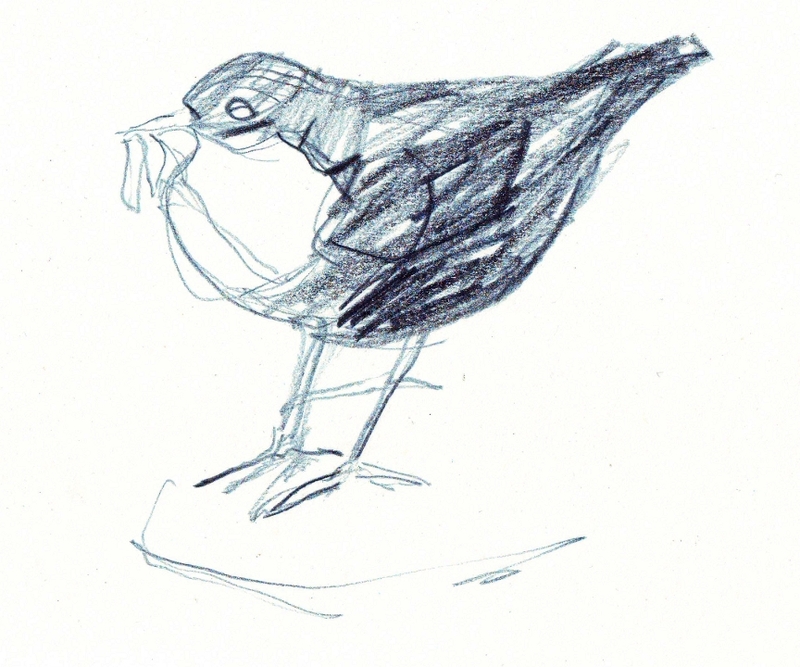 This is a page from my sketchbook – the drawing (hopefully) gives a sense of the preening movement of the birds and you can see my attempt to capture the long feathers which it was trying to reach under with its beak. . It felt very satisfying to immediately spend some time translating what I had just seen into colours and forms on the paper. Watch this space to see how the piece develops. 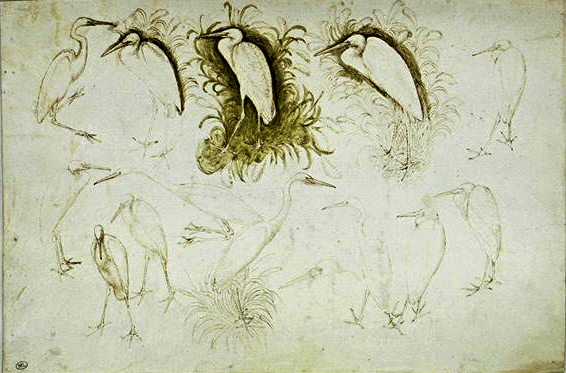 And to finish, some more heron images for you, firstly a sheet of egret sketches by Italian 15th century artist, Pisanello. 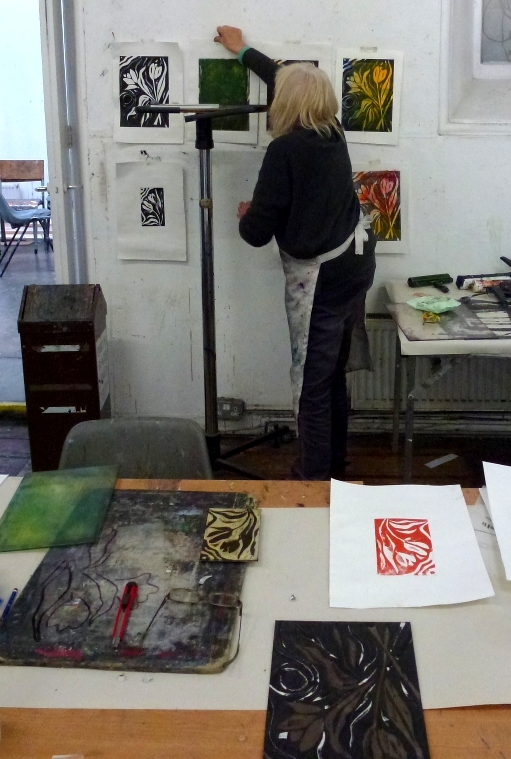 I recently taught a one-day workshop at Leith School of Art showing students how to combine two different printmaking techniques – collagraph and monotype. Those of you who know me and my work will be aware that I am pretty familiar with the art of monotype but collagraph is not something I have explored much. 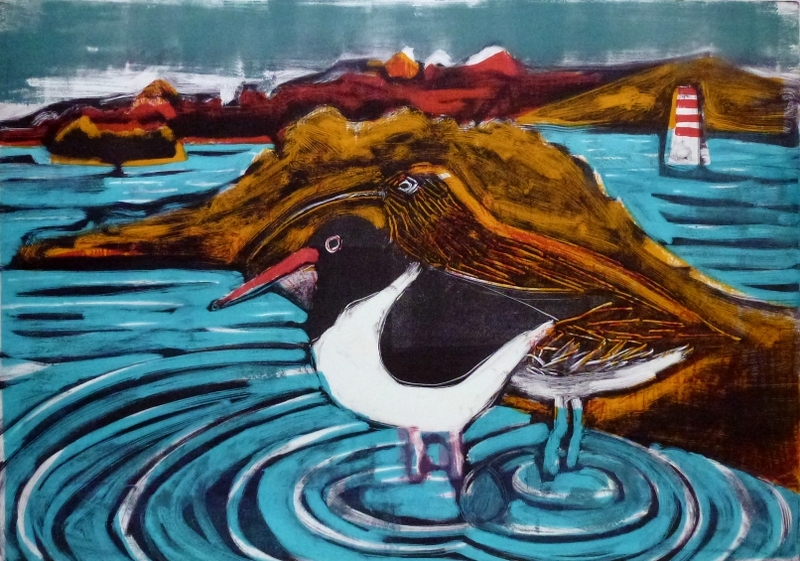 I deliberately decided to run this workshop as I was keen to try collagraph for myself and thought it would provide a good incentive – it did! 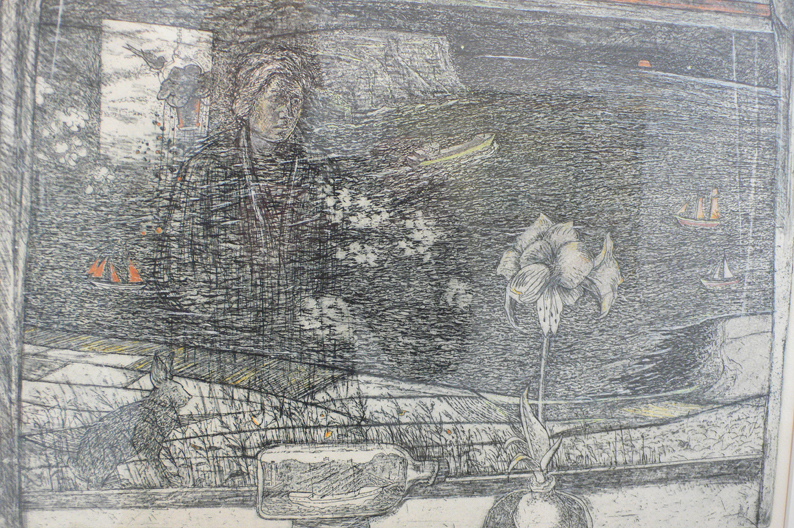 There are a number of different methods of making a collagraph, most of them involve collaging onto a surface to create a layered, textured plate which you ink up and then print. 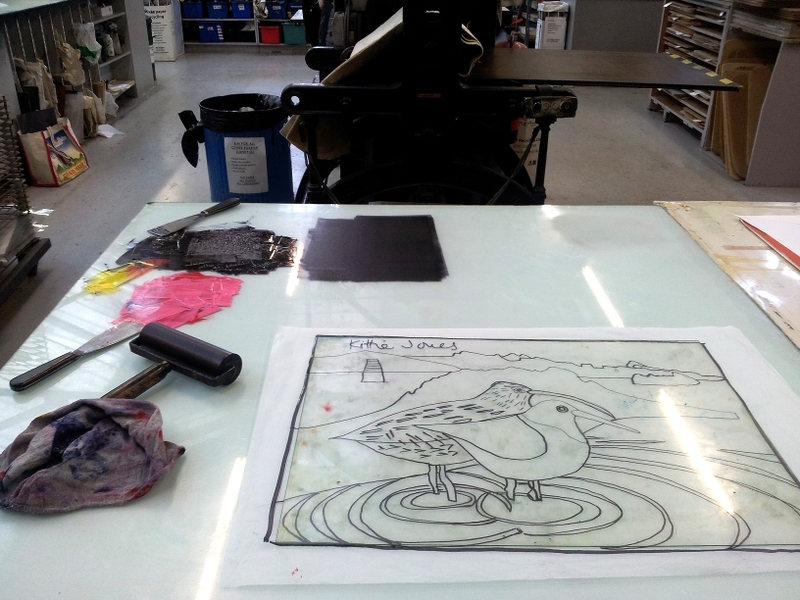 At Leith School of Art we use a multi-layer board called collagraph card which allows you to cut into it to reveal a mid layer and a deeper layer. 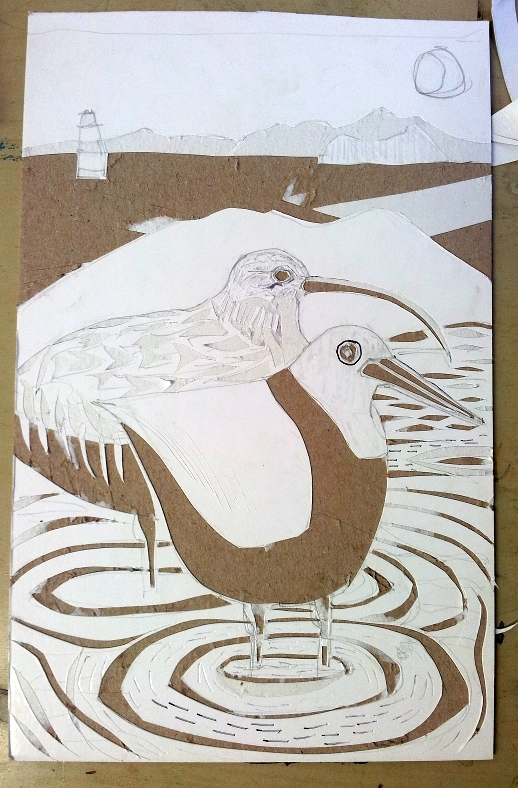 This means you can cut away as you would with lino cut or wood engraving but you can incorporate mid-tones into your design and also exploit the quality of the card by creating torn edges or drawing into the surface of the card with biro. 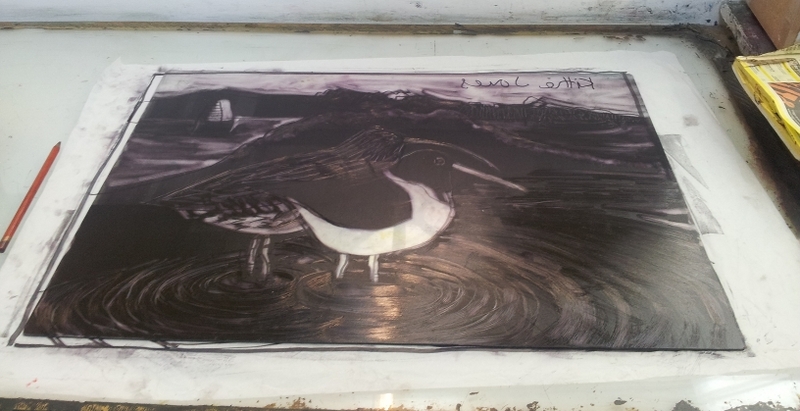 I like working in this way before rolling the ink onto the surface of the plate to produce the image. The Columbian press was first invented in 1813 by a Philadelphian mechanic and used to print entire newspaper pages with one effortless pull of the handle. In 1860 an Edinburgh firm called Ritchie and Sons started manufacturing these presses, the Leith School of Art model was made by them – so this particular press hasn’t travelled far in it’s life! 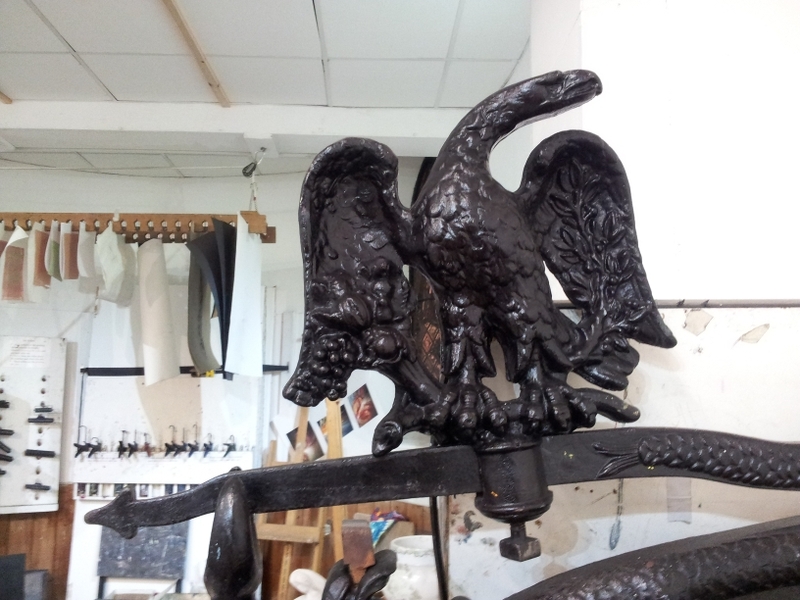 I love this eagle detail, what a glorious bird. I was excited to have the opportunity to use the Columbian press, you can find out more about the history of it here. 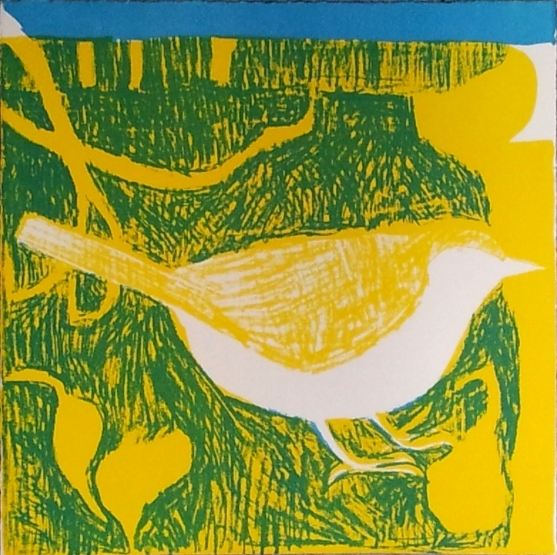 This was just a test piece but I was pleased with the effect of the graphic image of the card cut combined with the looser, softer colour of the monotype. 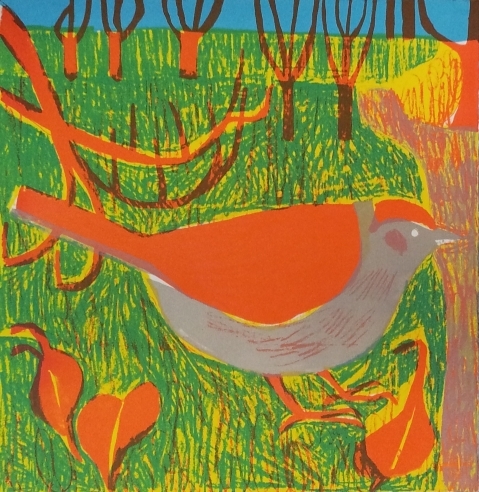 For more information and to see more examples of Tavener’s work have a look at his page on the website for Emma Mason: British prints. 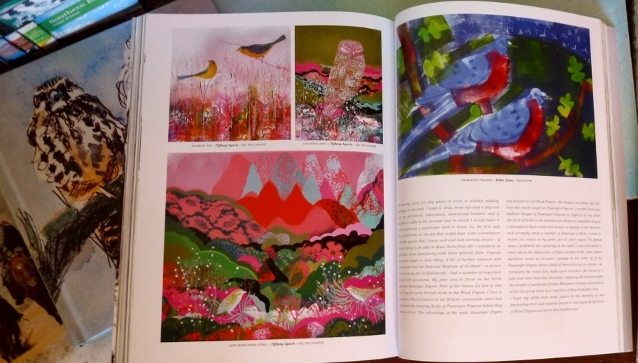 They have also produced a beautiful book of his work which is well worth a browse. 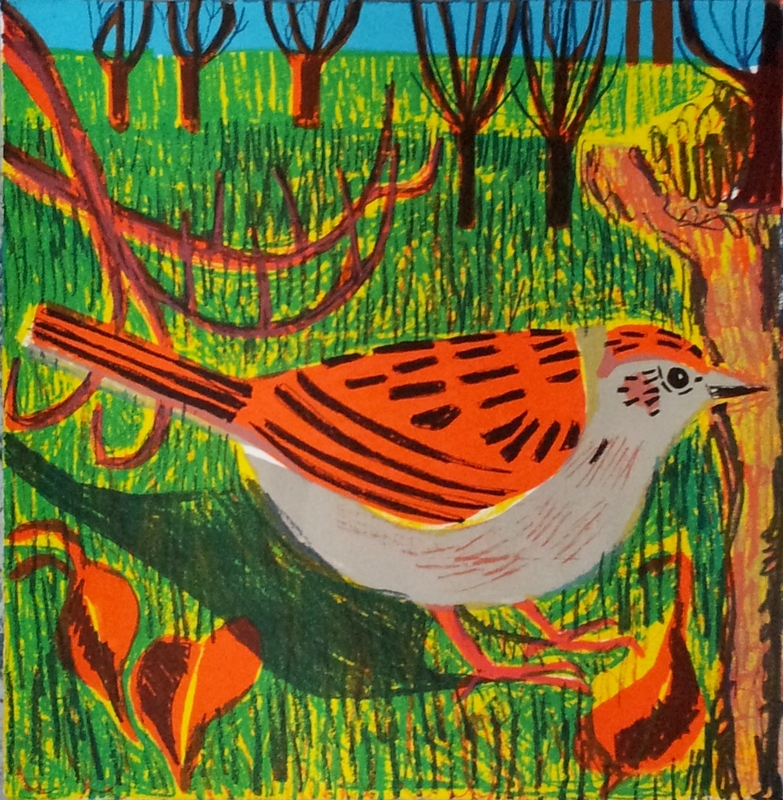 I have been meaning to explore the possibility of combining screen print and monotype together for some time. 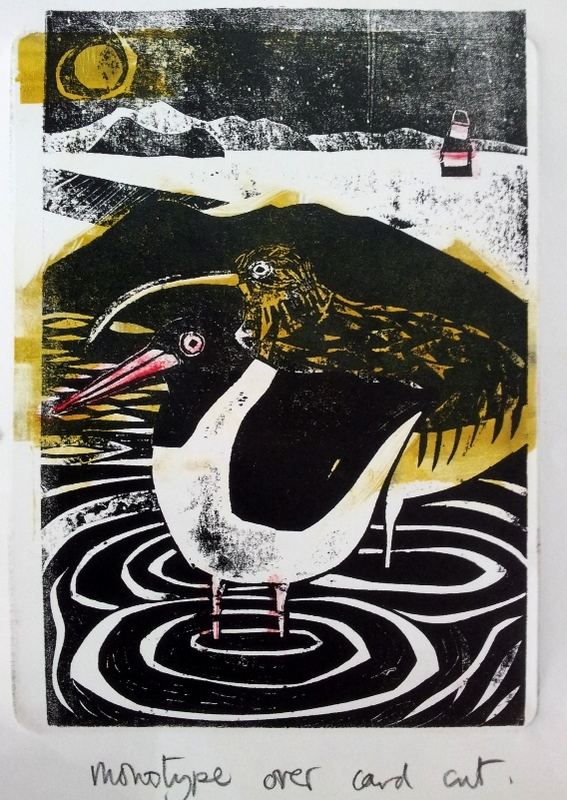 As they are my two main printmaking practices it seemed an obvious choice for me. 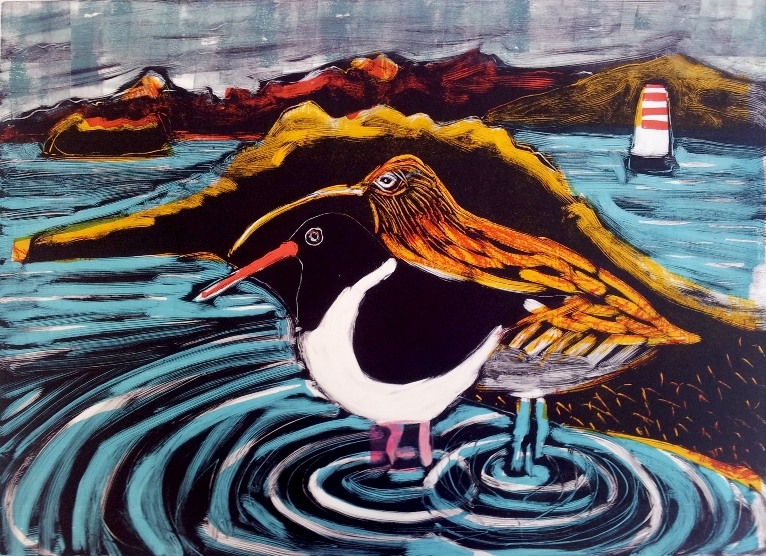 I stayed with the image of the curlew and oystercatcher for these prints, expanding the context to capture a sense of looking across the Firth of Forth to Edinburgh from Aberdour, which is where the initial drawings were made. Here is a brief visual diary of the process. 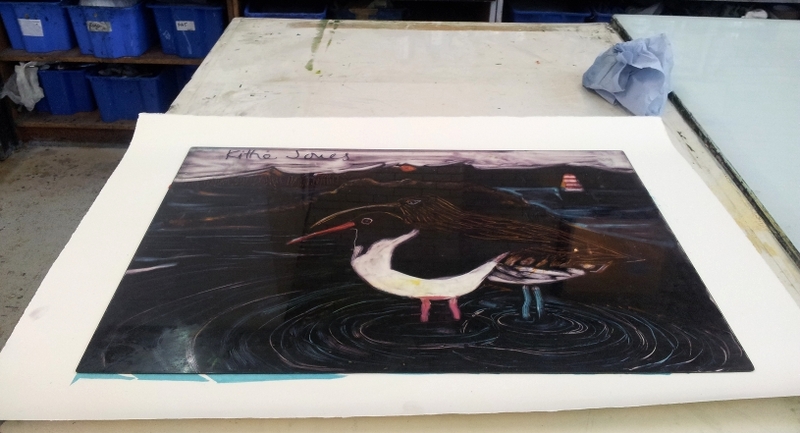 The first three layers were created as a screen print, leaving a simple design ready to take the final monotype layer (apologies for the poor quality image – it is the only one I have). Here is my monotype plate, ready to be inked up with a map underneath it so I know where I have to rub away the ink to reveal the drawing. Once again apologies for the poor quality of this image – too many reflective surfaces! This is the plate, it is initially inked up all over in one colour as a starting point for drawing into. I made three versions of the image – in each the screen printed layers remain the same but the drawn monotype layer is different each time. 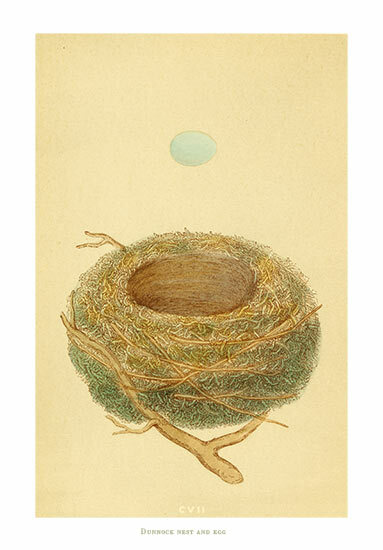 A dunnock nest and eggs, coloured wood engraving produced for Reverend Morris’ book of British birds nests and eggs. I like the way the egg hovers above the nest in this image. 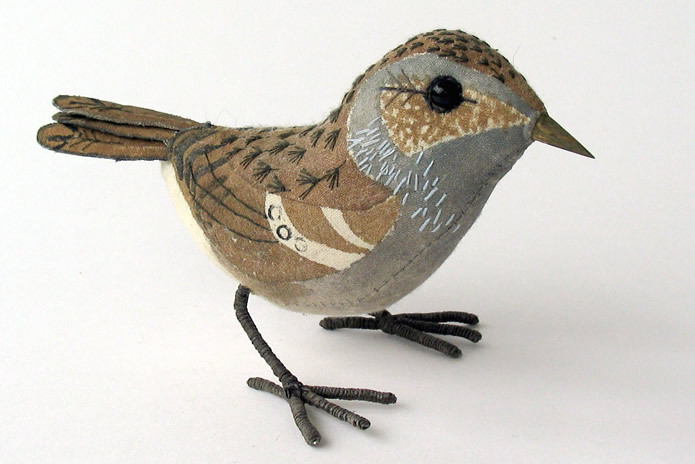 British nature poet, John Clare, has written a poem about the arrival of spring featuring a dunnock which he calls a ‘hedge sparrow’. 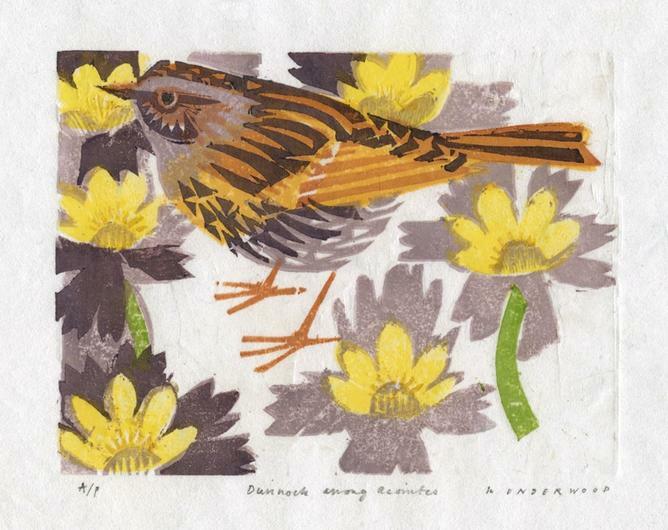 Dunnocks are often associated with sparrows, visually this makes sense, but it is a misnomer as dunnocks are actually part of the accentor family, ground dwelling birds found across Europe: http://en.wikipedia.org/wiki/Accentor. 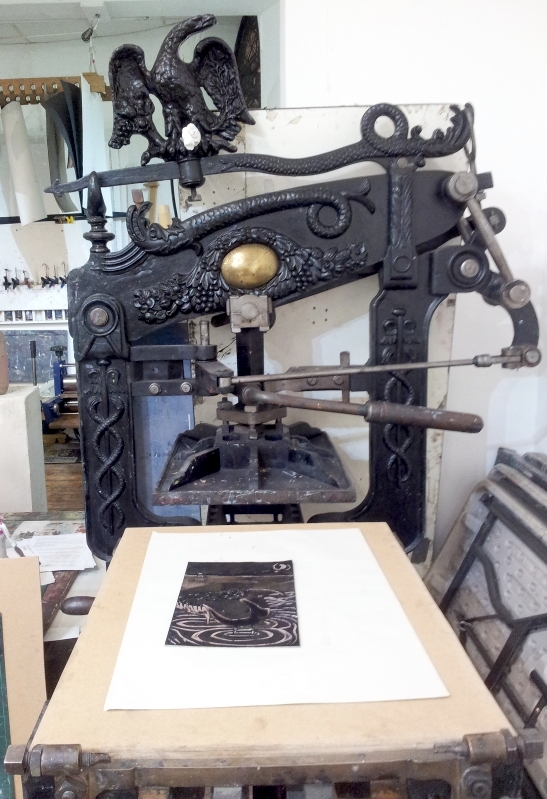 Finally – some of the sketches and stages of my latest print. It has been a busy year with lots of uplifting events to spur me on as an artist. My mission continues to be to appreciate nature and the natural world more myself and celebrate its wonder and diversity in my work. 2013 saw me: working more on sustained pieces out in the field, going bigger, collaborating with a poet and developing and pushing my work in new directions. My highlight of the year was attending the Natural Eye Exhibition, the annual Society of Wildlife Artists exhibition at the Mall Galleries. 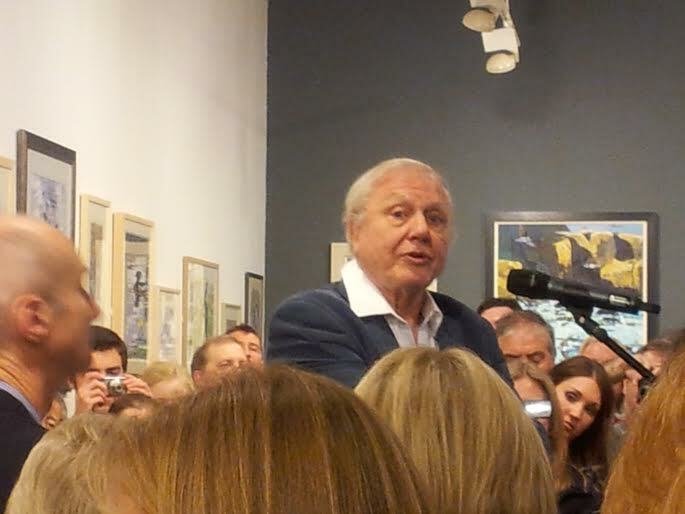 I was lucky enough to have five pieces accepted for the show, which was opened by none other than David Attenborough. 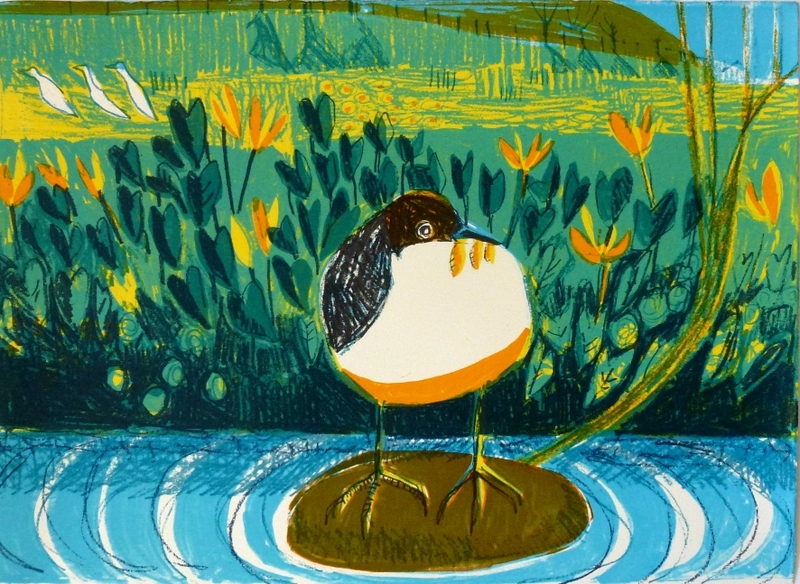 I was delighted to be there for the opening, which gave me an opportunity to see the diverse range of work on display and meet some really warm, enthusiastic people involved in the Society and the show (including Carry Ackroyd and Robert Gillmor – two fantastic wildlife printmakers). 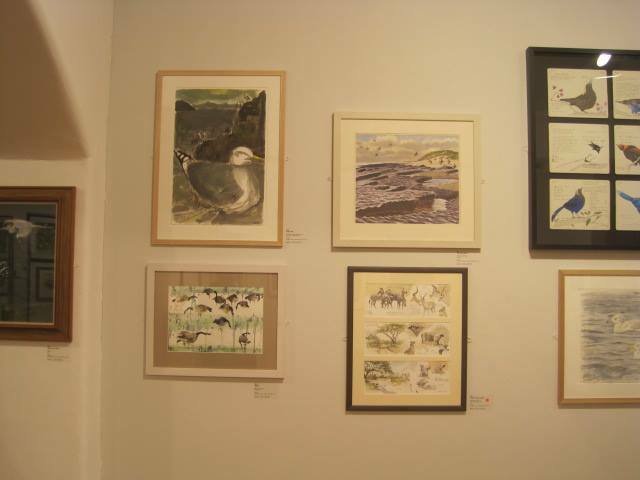 Much of the work I presented had been completed on the Bass Rock during the Seabird Drawing courses of 2013 and 2012 and many of the people who I met on the course were there in person or represented on the walls of the Mall Galleries. I was also lucky enough to be in the company of some inspiring people this year. During August I spent an enlightening evening listening to Mark Cocker talk about his new book, Birds and People at the Scottish Ornithologists Club Headquarters, Waterston House in Aberlady. 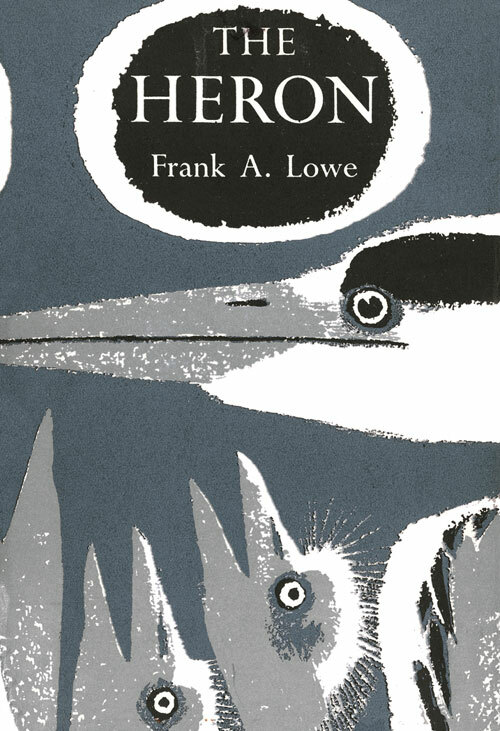 I first came across his sensitively observed book Crow Country which I would highly recommend and Birds Britannica (which he editted) is a book I return to again and again when I’m researching a bird. Birds and People is a huge tome, a collaboration with wildlife photographer David Tipling, it presents a sociological history of birds across the world and is a beautiful book to possess. The end of the year saw my work featuring in two great publications. 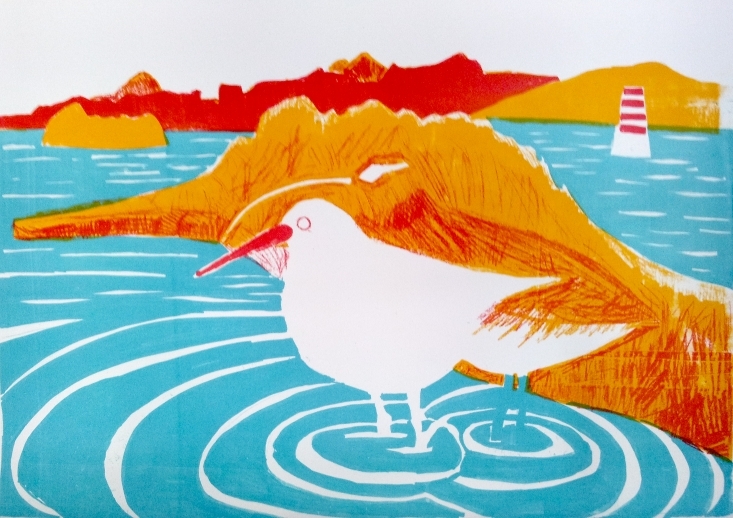 I was delighted to have an image selected for the beautifully produced catalogue of the Natural Eye exhibition – my Herring Gull and Shag, Bass Rock drawing featured in a double page spread alongside the work of Greg Poole, Kim Atkinson and John Threlfall. And then, in mid-December, the brilliant book documenting the Ghosts of Gone Birds project arrived on my doorstep. 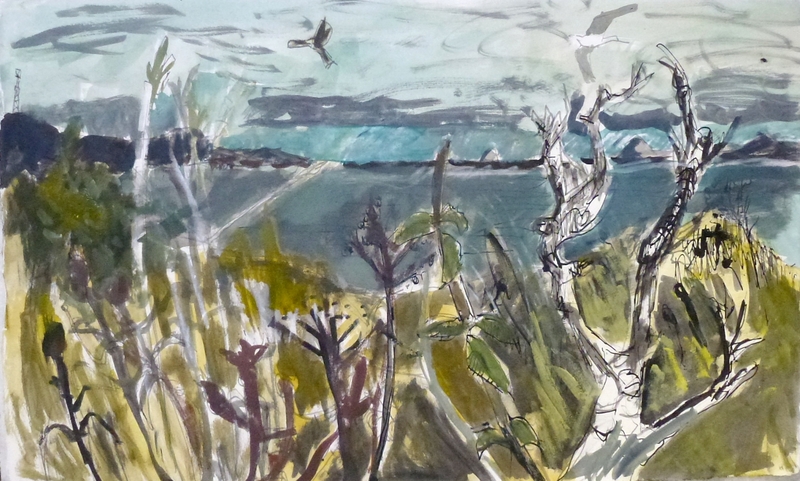 I will finish this post with some recent field sketches made on a trip to Aberdour – I’m hoping to develop these into prints so watch this space to see how they are transformed – and a happy and creative 2014 to everyone!